The H820 Bufford Lithos Sports Cards set is one of the few pre-war hockey-related issues classified in Jefferson Burdick’s American Card Catalog. Six cards are included in the set and they featured a variety of winter-related scenes. One depicted the sport of hockey and is generally more desirable among collectors. Other ‘sports’ shown are ice skating and sled riding. Two cards depicting ice boat regatta and a snow ball fight can be classified as non-sports issues. Captions on the cards were printed on some while others did not have them. When printed, these captions are found in small black lettering at the bottom of the images. other slight variations exist, including the printing/absence of a plate number. The exact date of the cards is unknown and, in reality, they could have been printed over a period of several years. Most commonly, they are advertised as being from the late 1870s and early 1880s. As trade cards, these were printed on thin paper stock and not cardboard. They were printed in color but didn’t use much more than black ink and light shades of blue and brown. The cards are trade cards used by advertisers to promote their business. Because of that, you will see these issues with various advertiser names printed on them. Some are blank, meaning they may not were used or distributed. After all, what is the point of promoting your business with the cards if there isn’t any information about your company on them? Collectors should note that a similar-looking series, Bufford’s Sleighing Cards, was also produced around the same time. They can be confused as being as a part of this set because they have a similar design/layout/color scheme, but are in fact a separate issue. It is often reported that two cards in the series depict the sport of hockey but that isn’t really the case. One called “Hockey on the Ice” surely does. Another called, “Race for the Cup” is commonly listed as a hockey card but that seems like a reach at best. The Race for the Cup card pictured here doesn’t seem to depict hockey. Collectors calling it a hockey card typically point to the sticks in the hands of the subjects skating. However, a closer look reveals that calling them hockey sticks doesn’t seem quite right. For example, here are side by side looks of both the Hockey on the Ice card as well as Race for the Cup. The sticks in the hands of the players in Hockey on the Ice are significantly thicker than the ones shown in Race for the Cup. 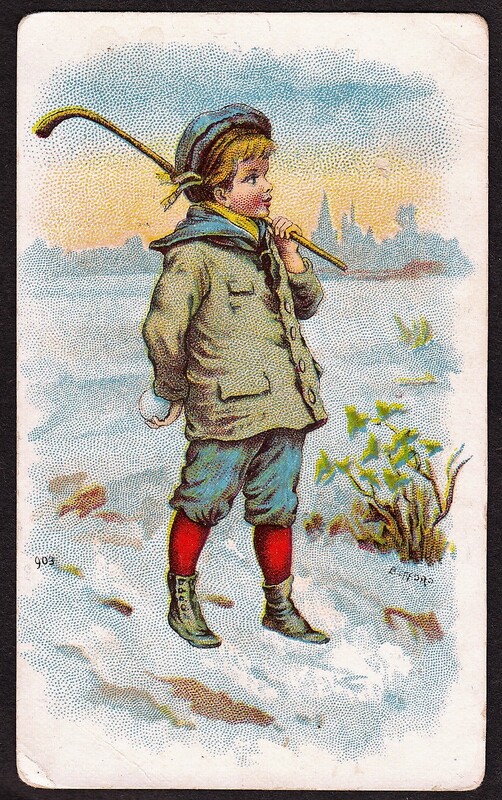 Specifically, the sticks in the hands of the woman near the middle and the boy to her right are much thinner and shorter than the hockey sticks depicted in the other card. Those sticks look much more like some sort of guide used in ice skating than they do an instrument with which you would play hockey. Similarly, there is no ball or puck pictured anywhere and the subjects seem much more scattered than they do in the Hockey on the Ice card. My personal guess is that this card merely depicts an ice skating race or some other contest of sorts. But it’s pretty clear that what is shown is not hockey. There are also several more variations than that. Burdick classified the set as H820 but didn’t give much more information. He indicated the size was 3 1/2″ x 5″ and since most of these actually measure 2 5/8″ tall x 4 1/2″ long, many assumed Burdick was simply off. However, other more variations of these exist in different dimensions and in addition to slightly larger cards, smaller ones are known, too. I have seen others measuring as small as 2″ tall x 4 1/2″ long and it appears that, at least some vendors that used the cards, cut them down a bit smaller. In addition, color variations exist. Some images have a more stark blue theme (like the Hockey on the Ice card at the top of this page) while others, such as the ones below it, are more muted, giving a more sepia-like tone. Finally, there are differences in card stock, too. None are on what you would consider thick stock since these are trade cards. But some are noticeably thinner than others. All of these variations seemed to depend on the printer’s stock availability and color preferences. While I’m sure some are rarer than others, there doesn’t seem to be much of a premium placed for any one type. 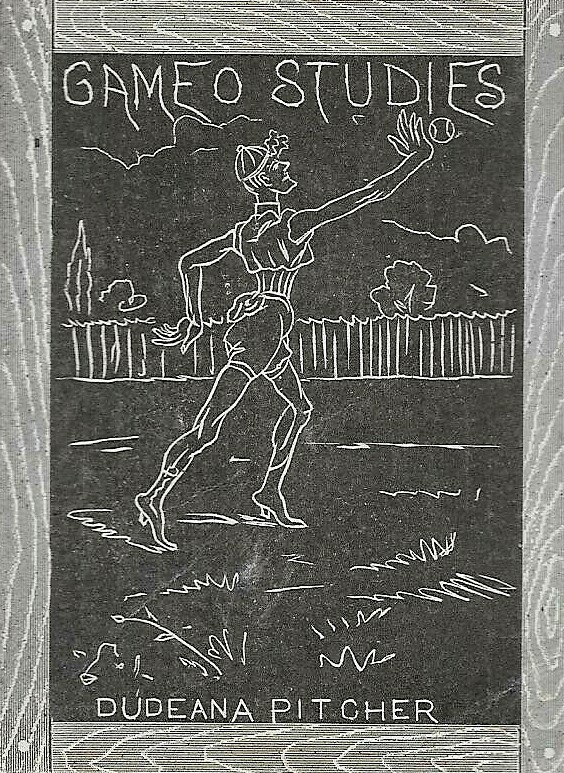 One misconception about the cards from some collectors is that they depict roller skating instead of ice hockey. That is because some, as one of the cards I’ve shown above does, included advertisements for roller skating rinks. However, the cards are surely depicting the sport of hockey, as indicated particularly in the title of the card, ‘Hockey on the Ice.’ The roller skating advertisements on the hockey cards is merely a coincidence with those advertisers printing its ads on that specific card.